Camp Improv Utopia is an annual three-night retreat where improvisers from around the world come to learn in a magnificent and unique setting. We spoke to actor/improviser and founder, Nick Armstrong, about improv as nature intended. P&C: For readers who don’t know, what is Camp Improv Utopia? NA: It’s an adult summer camp basically, so you have to be 18 and over to go. It’s kind of like boy scout/girl scout camp meets improv. You’re doing workshops with great teachers from all over, but then we really also emphasize that we want you to be part of nature. So you have free time to do archery and swim in the lake and kayak, and that’s the boy scout/girl scout part of the adventure. So it’s kind of a mix of that. 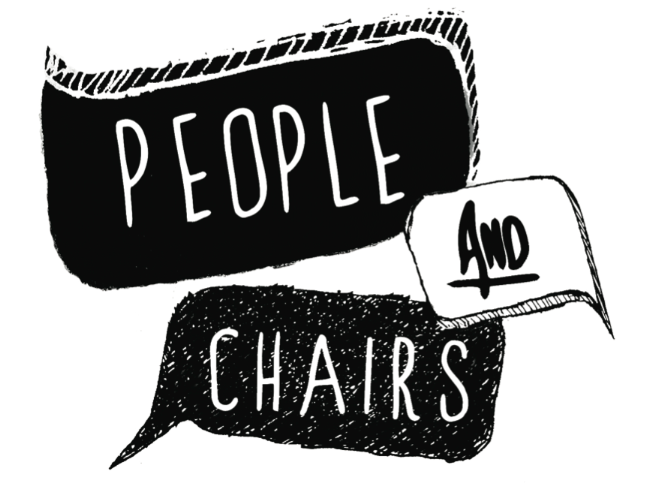 P&C: Why improv and camping? And so me and my friends from the Improv Olympic, I kinda threw them this idea, and they were like, “Yeah, that’s cool, let’s try it.” So we found a summer camp. We asked “Can you rent a summer camp?” And yeah, you can rent a summer camp! They’d never really kind of heard of it back then when we started, but we found the perfect place, we rented it, and we hoped people would show up. P&C: How many years have you been doing the camp? P&C: I’m gonna backtrack a little. How did you get into improv? I’d never seen a Harold before. It was a group called The Youth Group, and it was amazing. I never knew what I wanted in improv, but I saw that and it was like, “Hey, I wanna do that. I don’t know what it is, but I wanna do that.” And it just clicked. P&C: Holy crap! I didn’t know it was that many. NA: Yeah 110, but I’m sure everyone’s not listed on our site, so I’m assuming there’s probably a little bit more than that. We’re starting to get worldwide. NA: It’s a career for me. I’m able to call improv a career, in acting, so it’s very nice to do that. I still perform two or three times a week, every week since I started. I love it. It’s not like, “Oh God, I’ve gotta do my show this week.” I’m on the longest-running Harold team in LA called King Ten, and they’ve been together for 13 years. So it’s a fun experiment, because how many times does that happen? P&C: Ooh, I’m gonna have to interview you guys. Long-running teams are not that common. NA: It’s interesting because you keep trying to do things new, trying to push the envelope of a Harold. We don’t even do a traditional Harold anymore, it’s something that’s evolved into something different. The people on that team are just masters, so it’s really fun. P&C: That’s great. Getting back to Camp Improv Utopia, it’s a non-profit. Why was that important to you? NA: I was just talking about this yesterday. It was really important to me that it be non-profit, just like a boy scout/girl scout organization, because my philosophy is the spirit of improv should be how you run your business. I’m not saying “Don’t be a for-profit,” but for us it was nature, improv, giving back more than we’ve been given. So the idea was to bring all these people and do a two-part thing: we’re going to educate them in improv and give them a slice of nature. But then the money we raise there goes back out into the improv world. When it first started, it funded the National Improv Network…endeavours like that. We help the Detroit Creativity Project, which helps kids that don’t have access to arts; that’s one of our main people we sponsor. And then we help people build their theatres in the States. If they’re non-profits we help them a lot more; we do help for-profits that are starting out too. So [if] they’re like, “We need a stage,” we have a budget for who we help. Now that we have even more camps – we have two in California now and one in Pennsylvania – we can allot the money. The money from the Pennsylvania camp goes to that region of the country. We give out scholarships, and if someone has a diversity program at their theatre, we’ve donated to that, to specifically go to diverse talent coming in to their theatre. We’ll see someone’s Indiegogo or Kickstarter [saying] “We’re trying to open the doors to our theatre,” and we’ll donate to those. Sometimes people come to us and ask for help, and we do that as well. It’s just kind of a feel-good thing, but growing up that was always kind of my thing, just the motto of, “Give back more than you’ve been given.” And improv’s given me a ton, so this is kind of the best way to do it. P&C: That’s amazing. I don’t know if you’ve read Matt Fotis’s book about the history of the Harold. It’s fantastic. I’m reading about the struggles of Charna and Mick and the early days of Second City to find a space, and that can be such a huge obstacle to getting something off the ground, so the fact that you’re doing this is amazing. NA: Our thing is, the ships rise with the tide; we want everybody to be successful. We know improv because we live and breathe it all the time, but not a lot of people do, you know, still. NA: But like, every state has either one or two festivals, or two or three theatres now. In big cities like LA, of course Chicago, but also smaller cities like Cedar City, Utah, which is a population of maybe 20,000 people, and they all have great theatres and festivals happening. NA: It’s kind of like The Secret of improv right now. The big markets everybody knows about, but nobody knows about these successful theatres that are happening in smaller markets. I just got invited to the Omaha Improv Festival which is in Nebraska, and it’s their third year doing it. P&C: Your mission statement advocates improv as an art form. Are you a strong proponent of Del’s views? NA: I believe in Del’s philosophy; I grew up in the iO philosophy. Craig Cackowski is kinda my mentor; I’ve grown with him, he’s now my friend, and he’s helped me with these camps too. And he definitely sees it that way and that definitely rubbed off on me. It’s an art form and it can be funny, it can be both, and that’s what we try to do, but I love when there’s serious moments when you make the audience not laugh, and you make them gasp, and that’s really magical. When I first saw a show, I want to give that feeling to someone else, because my thing was like, this is funny, but there’s something magical about it [too] that I didn’t know when I was seeing it for the first time. I wouldn’t have maybe come back to that show because, “Oh, that was really funny,” y’know? But it was that extra “sauce,” whatever that was, that got me to come back, and that was the art form that was pulling me towards it. That’s really how I love it, and that’s why I’ve done for so many years, and that’s how I teach it, too. P&C: Is there a common thread among the teachers you’ve chosen? NA: We’re very careful about how we choose our teachers. We choose teachers that are great in the community. Not only are great teachers and well established – that doesn’t necessarily mean they have to be a Second City teacher or an iO teacher or something like that – but it’s also someone who gives back to improv more. We recognize someone like a Jill Bernard, who goes above and beyond the call of duty. We like to honour those folks and bring them in because they really mesh with that community well, and it really works. So that’s kinda what we look for: Are they great teachers? Do they go above and beyond in improv? Are they helping, are they going to festivals, are they trying to build this community? NA: We haven’t opened the third one yet; that happens next year. P&C: OK, two-part question: Do you have plans to expand to other parts of the country eventually? And do you have students who’ve come more than once? That was kinda the goal, to circle the US, and do that, and that’s working! (laughs) Now these festivals over on the East Coast, there’s people from the West Coast coming to them and vice versa, and that cross-pollination is totally happening, and I’m so excited about that. And then we came up with Yosemite I was like, wait, we have one of the most beautiful places in the world at our fingertips. Why don’t we do a summer camp by it? But we’re also doing a different curriculum with that one, so that one filled up really fast – and we only promoted that to our previous campers, we didn’t even put it out to the public. NA: … and these are taught by people that created those forms. And then the idea is to hopefully take those back to your community, experiment with them more. Maybe do the form itself, but then maybe be inspired to make the next great form. So…we’ll do another camp if it’s necessary, and right now we have the Yosemite one, and if we see an opportunity to do another we will, but it’s not, we don’t wanna be a burger chain. NA: We wanna do it right, and it has to be associated with our mission statement, and it has to help a community. P&C: You talked about the one-instructor, one-form curriculum at Yosemite. Can you tell us about the curriculum at the other camps? NA: Our East and West kind of share a similar curriculum. There’s five teachers, and you can pick four, so there are more skill sets. So if you wanna learn character, or you wanna learn slow play… I always try to tell the teacher, teach what you’re passionate about in improv. I don’t care what that workshop is, but I’m hiring you because I want you to bring what you think people should know in improv. And for Yosemite we’ll just be teaching a form, so for instance Craig Cackowski will be teaching the J.T.S. Brown, which he was the original director of in Chicago. So that’s kind of how we separated it to be different, and that was kind of the purpose of that whole new camp. Again, it’s not all education; we perform. We have little cabins, there’s like 10, 20 different cabins, and that becomes their troupe that weekend. So then they perform a show at the end of the weekend, too. P&C: And I was reading you have axe throwing? NA: (laughs) They’re little axes. They’re, I would say, hatchets. We have professionals handling that, we don’t handle the axe throwing, we let the camp run those. No one’s been hurt in the six years we’ve run them! P&C: Safety first. OK, who are some of the instructors you’ve had? NA: Craig Cackowski, Dave Razowsky, Susan Messing, those are some of the bigger names we’ve had out. P&C: After six years, do you have any favourite memory that stands out for you? So people signed up, and we were at the camp, and we got there Friday at like six in the morning, going, like, “We’ve gotta get there so early. What if someone comes? !” And we put out a table and we were ready to register. And my friends, now who are my board members, are all there, and we’re sitting there. But now I think about it, it’s ludicrous, because no one’s gonna be there Friday morning at six! But we didn’t know, because we’d never done it before. And so at like, one o’clock a car rolls in, and it was a camp cook. We just all started cheering and he probably thought we were crazy. And we’ve now made that a tradition that we always cheer when someone comes to camp. There’s been so many memories after that, but that’s the one that sticks in my head just because it was so cool. P&C: Last question: what do you hope people take away from their experience? NA: That they have an experience. That it’s different than being at an improv theatre. It’s not all about improv out there. It’s about looking in yourself, it’s about being out in nature. When I started the camp, I said I don’t want it to be like a festival. I want it to be an experience where people do get quality instruction that they can’t get in their communities, and that they really immerse themselves in nature. And just being out there without technology – because cell phones don’t work at our West Camp really, so that’s a good thing. And at festivals there’s enough campers that go to festivals that sometimes festivals have allotted us a Camp Show, a Camp Jam. And we’re doing it in Ireland, we’re doing a Camp Jam. So that stuff to me is the coolest part. It’s not just at camp, it’s what happens after camp, and that’s what you want, you want them to be, “Hey, you’re coming to California? Crash at my place.” “Hey, I got a show at iO, let’s do it.” And that’s how the National Improv Network grew out of it. P&C: That’s fantastic, just spreading the joy of improv on a global scale. Thank you so much for talking to us. Enrolment for Camp Improv Utopia East is now open. Click here to register. West – Celeste Pechous, James Grace, Bill Binder, Eric Hunicutt, plus more to come! East – Jaime Moyer, Elana Fishbein, Isaac Kessler, plus more to come!